The logistics landscape is about to change drastically, procurement needs to get ahead of it. Over the next seven years, the logistics market around the world could change, as businesses look for better performance and cost savings for some time to come. Multiple predictions show the way future developments could play out, going beyond 2017 in the upcoming new decade. TradeArabia News Service recently relayed data from an Al Masah Capital forecast for the worldwide performance of logistics. According to this source, just three years from now will see the third-party logistics compound annual growth rate jump by more than 5 percent. What's more, the logistics market as a whole could hit a revenue value of $15.5 trillion four years after that. This wasn't the only source predicting high CAGR to come. In a February press release, ResearchMoz said that the global secure logistics market would grow at a 9.38 percent CAGR until 2020. While this is a different sector than the global logistics market itself, it relates to the kind of activity necessary to keep logistics stable around the world during the same important period. Getting more specific, another report showed the particular CAGR benefits on the horizon for rail-based logistics. Global Trade Magazine recently spoke to Technavio logistics research analyst Sharan Raj about the improvements coming to the rail freight industry. Technavio recently forecast that rail logistics will be worth $210.13 billion in 2021 and have a CAGR around 4 percent between now and that year. Sharan Raj said that the American rail market has room to improve over the next few years, leading to an increase in demand. This could follow a much larger prediction for rail travel growth around the world. Arup Foresight's Future of Rail 2050 report takes the forecast further into the future, and although it largely focuses on the travel side of rail, it references trends which could influence rail in general, such as massive growth in urban populations, improvements in green technology, and, perhaps most crucially, entirely new types of transport, such as airships and low-earth orbiting space vessels from NASA. These could have freight implications, despite how far off they might seem at the moment. The report also looked at the outside factors which could undoubtedly impact production. By 2050, the world will consume 140 billion tons of resources, for example, which could both impact the way logistics operates and put more value on flexible, green transportation. Automation and robots could not only improve production, but also make it easier to perform dangerous inspection and maintenance tasks, as the amount of repair robots increases. It's also useful to think about the role of forecasts in general. 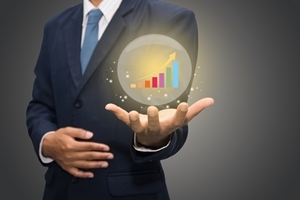 Predictions are both a useful tool now and one of the possible advantages of greater use of analytics. In a piece for Supply Chain Digital, Dr. Muddassir Ahmed outlined several of the advantages, including responding to customer needs and aligning current inventory with likely market conditions. In the same sense, procurement management ahead of time is a possible benefit for future logistics planning.